It may be Monday, but the mad scientist lab is still open! Beakers are bubbling. This is acrylic and watercolor on 5 x 7″ Arches 300 lb. cold press. I enjoyed making this, and will be doing more of these, combining watercolor and acrylic on the same painting. I’m going to check with Golden today, but based on some information I found on their site, using watered-down acrylics as a wash on paper will work, as the substrate absorbs the wash. I just love the vibrancy of acrylics, and want to continue to enjoy them by combining them with watercolor as we celebrate World Watercolor Month in July! Have a joyfully creative week. Peace. Hope your week ahead is as lovely as this swirl of color. Thanks, Kathy, and the same to you! Glad you enjoyed! Laura thanks for sharing your explorations. This one is very interesting ..I have some Golden acrylics packed in my art supplies. The thought of combining with watercolor is exciting. You also have a great week! All that green and yellow feels like summer to me. Thanks, Laura. I guess it’s appropriate for today, then 😀 It was fun to do. Beautiful! Looks like the top view of a lovely forest. Thanks! I love that interpretation! Glad you enjoyed it. Love hearing about all your experiments. I’ve never thought of combining acrylic and watercolor, but I’ll have to try it now! I love this. 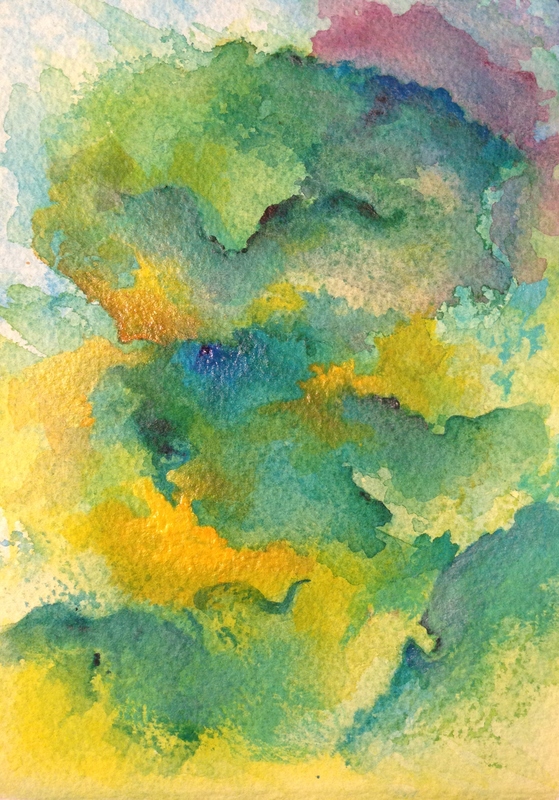 This is the sort of “abstract art” that I really enjoy…all soft and swirly and colorful. It’s got a really cheerful feeling to it. Very summery. Thanks, Judith. It’s fun to experiment, and I like the bold vibrancy I can achieve with one layer of acrylic paint, but if you’re ever thinking about archival qualities and the viability of the film layer, etc., there are steps that should be followed. I just had a long talk with a technician at Golden, and it is do-able, but there are lots of factors (or potential factors) involved. For this one, if I was thinking about selling it or framing it, I would likely want to seal it first with a gloss or matte medium. I think it’s really fun to just play and see what happens when they get together though. Part of the fun of art! Definitely fun, especially when the results turn out so wonderfully. 🙂 I wonder if sealing it would affect the colors. That happens with charcoal and pastel. I’ve stopped sealing anything unless I absolutely have to. I look forward to seeing more of your “combos”…and I will definitely try it one of these days. You mesmerize me with your mad scientist experiments….. Fantastic work, Laura! Aw, thanks so much, Donna! I almost felt like I was dreaming at times while painting this. Kind of hypnotic! It was fun. Reminds me of a chameleon. My lines, boxes and circles? Giggle. Yes! Maybe on a baby canvas (or Artist Loft) lol? You have a great color sense! I’m thinking artist loft…but then I will be bugged it if comes out good. Maybe I better do my babyest Blick which is 11 X 14. That seems like a good size I think. This is one you could get lost in. I really like it a lot. Very evocative and dreamy. N.
Nina, thank you. I almost got lost in it myself, painting it! I’m so glad I’m not the only one lol. Thanks, Snehal! Are you going to be painting every day in July in watercolor? hey hi Laura🙋how are you friend? Oh that’s right, you moved, right? I hope you’re liking your new place! Nice to see you back, Snehal! My body won’t let me sleep as much as I used to anymore. Look out for meno, Tierney, lol. lol! Thanks so much, Susan! Woot! Me toooooo lol. I wanted to try the Q’or watercolors by Golden. They’re supposed to have a really strong pigment load. Have you ever tried them, Margaret? I am so hooked on acrylics now, but wanting to get the wc effects with the really strong colors (and I love their hues too)……I noticed the color names are the same, so may be worth trying my current fave to see how it compares to the Golden fluid acrylic. This was so much fun to paint, Margaret! I love the effect of the textured wc paper on the acrylic. I think I prefer working on wc paper to canvas! Which is great, because I have a ton of wc paper and don’t want it going to waste. ❤ Glad you liked this one. I really do feel like a mad scientist at times, my art ADD kicking up again lol. hehe…..you always seem to get the job done, bravo! but wait you are still going to do watercolor in July 😦 pretty please! I will have to look at those watercolors, I do love strong and bold color! Yeah, I’m going to do watercolor in July, but I may combine with acrylic. Otherwise, I may not want to do it, and certainly not for 31 days. Just too into acrylic right now. But loving the watercolor look I was able to get with them on this piece! Blick is sending me dot card samples of a bunch of Daniel Smith paints (I had no idea they make iridescent and interference colors – I thought that was only Golden acrylics!) and also some of the Qor colors. I thought I’d try some out and demonstrate them – even if they’re just paint swatches. Of course, you can always call Blick yourself and request the same samples. They don’t give preference to affiliates (as far as I know). I know you’re a big DS fan. Have you tried their metallic or interference colors? I got some of the (DS) dots and yes, I totally love the metallic and interference colors. Good for you…..maybe doing a combo of acrylic with wc will be your segue to wc, but who knows you might always paint the two together…..this is your artist journey and no one else’s. As much as I get excited about the thought of you embracing wc, what benefit will be for you if you can’t jump on board. I might try the two together one of these days but first I would like to get some Golden acrylics. Margaret, you won’t regret it. Not sure if you feel like sampling some texture products and all the different products in the Golden line (High flow, heavy body, fluid and Open), but if you think you might, I really recommend looking at one of the Golden A to Z sets. A little bit of everything at a (IMO) dynamite price. If I had your skill with paints of any medium, I might try and embrace wc whole hog, but I have not forgot last July, in which (coincidentally) I tried to paint in wc every day. Oh, I wanted to throw my brushes many times. (seriously) and not sure I wanna repeat. ah….I didn’t realize that, should I go take a peek? lol just ribbing you. Hey, you go with what you love or think you’ll love. haha, feel free to peek away, I posted all of my paintings, warts and all. Nothing like what you did in May, mind. Oh they were mostly pathetic, but a couple kind of ok ones came from it. I do love wc but I want that vibrancy. And I don’t want my toes permanently disfigured from the stomping lol! hehe…vibrancy is something that you have to fight for with wc but it is worth the fight. It teaches you about adjacent colors and placement and patience. Me, talking about patience, haha! what a hoot! I have a lot to learn there, Margaret. I need to memorize which red and blue to use to make a great purple, for example. Every time I figure it out, I forget by the time I wanna paint again. Any book you could recommend? hmm….I think that once you get in and start doing it, it will become automatic. I have read and looked at a lot of books, I say experience and the doing is your best bet. Mixes right down to not just the colors but how much of each will get you different colors, it is a matter of experience if anything. Makes sense. I’m always looking for the magic bullet, Margaret! Your battle with wc sure turned into a dance, but you’ve got mad skills! This looks like it is a made scientist at work – creating beauty!!! 🙂 And guess what!????! I did a combined watercolor and acrylic this weekend tooooooo. I started with watercolor base and jazzed up with acrylic. LOL! Not sure it is worth sharing – thinking about it….. LOL! YAY! Oh, I’d love to see it! 😀 It is so easy to jazz up a watercolor painting this way. Acrylics are so much more vibrant. I think for abstracts (and probably for almost anything) – why not go whole hog and really dive into the most brilliant color you can?? And as long as you’re not watering them down (the fluid acrylics) more than half, you are all good. I hope you share, Jodi! I had so much fun painting with acrylic on this surface – it’s my favorite of all the surfaces I’ve tried with acrylic so far! awww…hehe… spoken like a true sister! 😉😃Thanks! Hey Mad Scientist – you can do washes with watered down acrylic… Just another experiment… Imagine the chroma is more intense even when diluted… Have at it! Good to know, Grlie. Do you water down the acrylic, or put it on dry paper full strength? Thanks, Jill! It was so much fun! Have you ever painted with acrylics on watercolor paper? Love the texture for acrylics! Woot! I probably wouldn’t even be painting in acrylics if it weren’t for you, Jill! Yay for inspiring you back! Oh, thank you, Kerfe! I was thinking about clouds as I painted it. I see the trunk of an elephant lower left, I’ll have to look for the dragon. Thanks! So lovely, Laura. I want to dive into the color! Me too, Sharon! I’m so glad you like it! It kind of put me into a trance at times while painting. I love this combination of brilliant bright yellows and greens. And the soft touches of rosy pink in the top right are just right – fabulous! Thanks, Carrie! It was fun to make! Woot! We need more of those! Thanks Iris! Real nice workout with the color combinations – I like the depth achieved from the darker values within this piece. Very cool Laura! Thanks! I almost went into a trance at times with this piece, it kinda felt like a dream. It was great fun though, just melts the stress away.